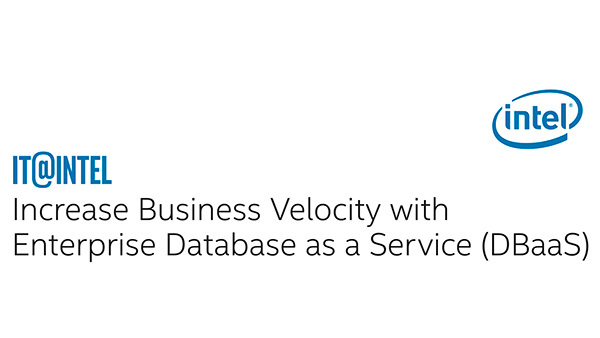 IT Best Practices: To increase business velocity and cost efficiency, Intel IT designed and deployed database-as-a-service (DBaaS) capabilities on Intel’s enterprise infrastructure. The solution is unique in many ways. For example, we were the first IT department to incorporate the commercial database technologies in use at Intel into a DBaaS system. Unlike many DBaaS solutions on the market, our system goes beyond simply provisioning database instances to provide end-to-end database management services. Back in 2014, when software-defined infrastructure was nascent, we were programmatically creating virtual machines using APIs. Application developers can launch a new database instance in less than a minute and are freed from managing infrastructure details. This capability in turn increases time to market for new products and services. Multitenancy and smart provisioning tactics optimize utilization of compute, storage, and network resources and enable scalability. New database instances can be added without adding headcount. Governance capabilities help us reliably meet service-level agreement requirements. As our DBaaS system continues to evolve, we plan to use the best practices captured in this white paper to add new capabilities and technologies to further accelerate Intel’s pace of business.